Celebrate the #FlavorsOfFall with us! Fall is just around the corner! From now until November 30th, we'll be giving away 50 Free Juice Coupons. We want you to fall in love with Old Orchard this season. Post a picture of you and your favorite Old Orchard flavor in your favorite fall location on Twitter, Facebook or Instagram! Be sure to use the hashtag #FlavorsOfFall and you will be entered into the sweepstakes! Enter as many times as you want -- prizes are limited to one per person. So, get started -- we want to see what you love about fall! NO PURCHASE NECESSARY. A PURCHASE WILL NOT INCREASE YOUR CHANCE OF WINNING. Open only to legal residents of the 50 United States, who are 18 years of age or older. Void wherever prohibited by law. Employees of Old Orchard Brands, LLC ("Sponsor") and its respective affiliates, subsidiaries, advertising and promotion agencies, suppliers and the immediate family members and/or those living in the same household of each are not eligible. 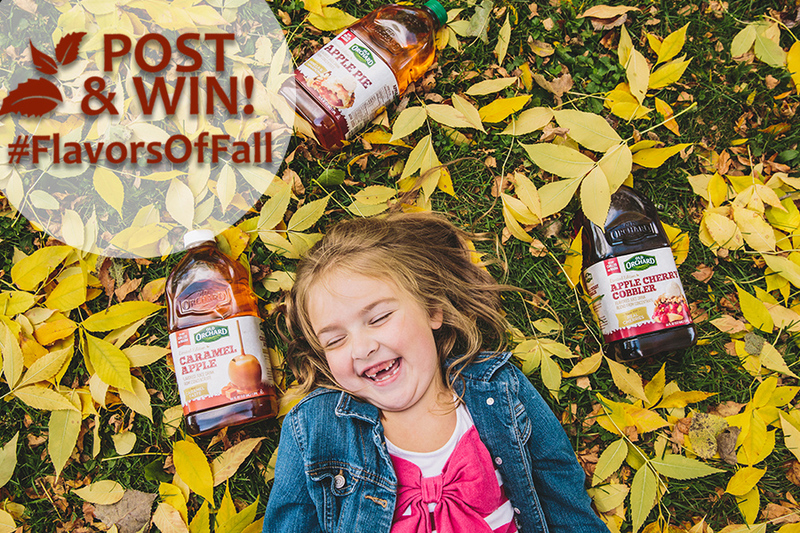 To enter, upload and share a photo of you and your favorite Old Orchard juice via Twitter, Facebook or Instagram using the hashtag #FlavorsOfFall. There is no limit the the number of entries you can post, but each entrant is limited to one prize during the promotional period. Entries must be received in the month of September until November 30, 2016 to qualify. Photos that do not include an identifiable Old Orchard product will not be considered valid entries. Sponsor reserves the right to contact entrants and all other individuals whose information is submitted as part of this promotion. Up to 50 winners will be selected at random from the eligible entries after November 30, 2016 -- each to receive a free product coupon for one 64oz bottle of Old Orchard, up to a $3.49 value. Winners will be notified by via the social media channel on which they entered their submission. Winners are responsible for contacting Sponsor with appropriate address and contact information. Sponsor shall not be liable for any prizes that are not received for any reason, including incorrect or inaccurate addresses, or lost, damaged, or misdirected mail. Entrants are responsible for ensuring local product availability. Prizes will not be exchanged or substituted. Except where prohibited, your entry in this sweepstakes constitutes your consent to Sponsor to use of your name, likeness, photograph, voice, opinions, hometown and state or province, and entry (with or without attribution) for promotional purposes in any media, worldwide and without further payment or consideration. By receipt of any prize, winner agrees to release and hold harmless Sponsor, and its respective parent, subsidiary, affiliated and related companies, successors and assigns, suppliers, distributors, advertising/promotion agencies, and prize suppliers, and its shareholders, officers, directors, employees, representatives and agents (collectively, the "Released Parties") from and against any claims, demands, losses, promises, cause of action and liabilities, including, but not limited to, personal injury, death, or damage to or loss of property, arising out of the preparation for, or participation in, this sweepstakes or receipt or use or misuse of any prize. A list of winners can be requested from Sponsor here: http://oldorchard.com/club/account/contact.